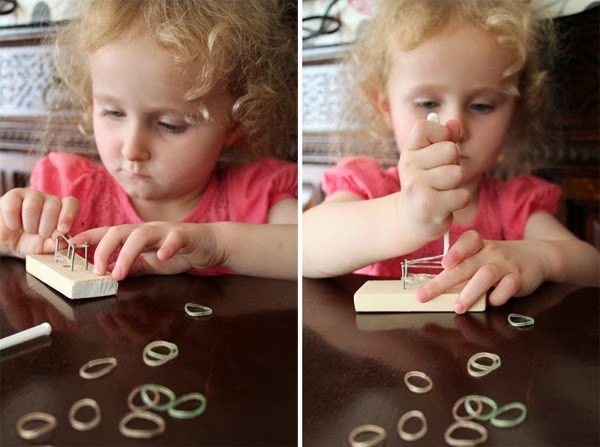 Loom Bands! It's a craze. 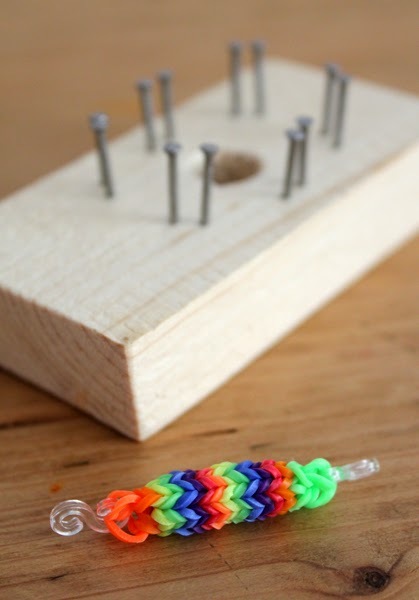 A big fiddly tweeny fad that just last week swept up my eight and nine year old. I've been reliably informed by friends back in California that this is very much a "thing" over there too. I just need to keep the tiny rubber bands away from the baby because he's pretty good with the old fine motor skills for a seven month old, and everything looks like a tasty snack to him! 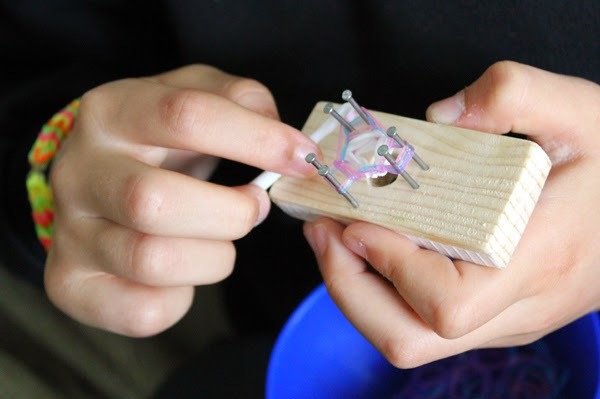 I wanted to slap up a few pictures of the hacked together looms that we made today for the kids to make different types of bracelets on. There are no photos of them actually being made because I was out in the back yard on my hands and knees with a drill and a toddler and a baby in a buggy and you just need to see them to realise exactly what I did, because it's really simple. 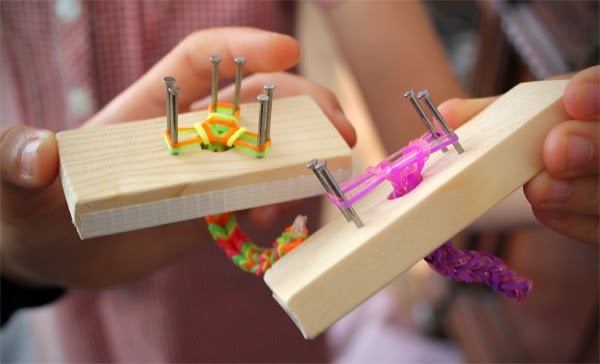 I wasn't going to be getting the proper plastic loom thing that is sold to make these with, because I'd have to get two because there are two older kids for a start, but also they just look like they are over engineered for the job. 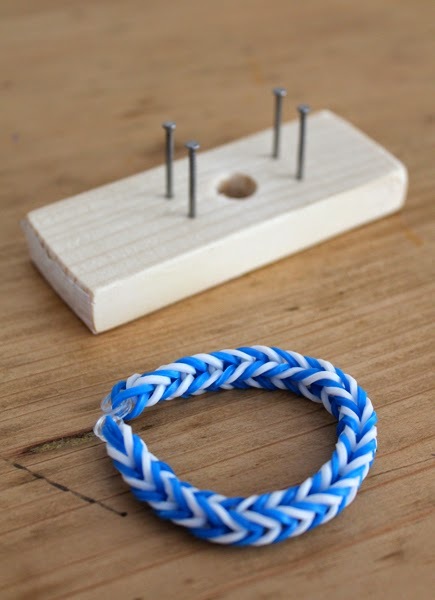 The kids had been making the more simple bracelets just using their fingers to loop the bands over, but it becomes tricky to put things down mid bracelet when you're doing that, and you can't do the more complicated ones with fingers anyway. 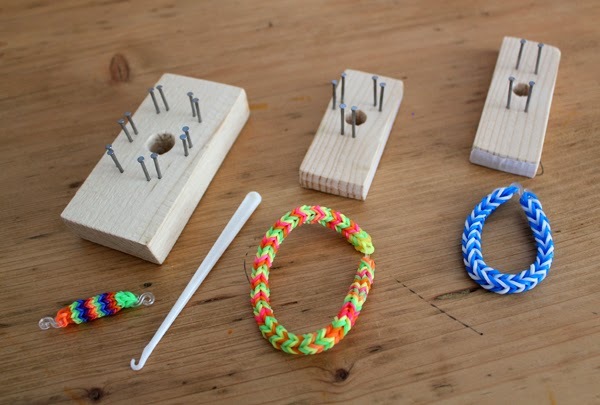 We made three different looms, each by just drilling a hole into a bit of wood and then banging a few little nails into the appropriate places. Sanded the wood a little to smooth off the drilled hole and edges, but really it was that simple. By using two nails fairly close together as the loop point, it's really easy to get the little hook in to pull the bands over. 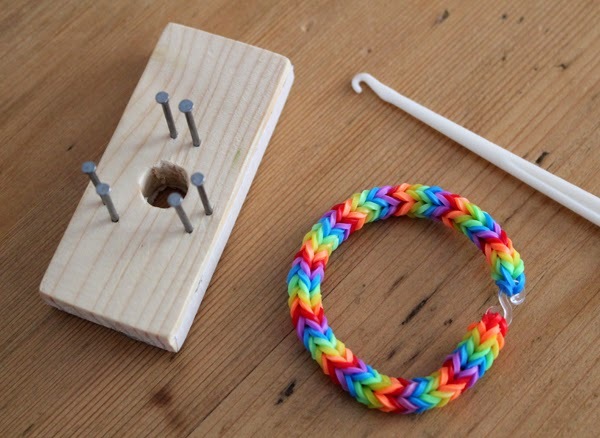 The easiest loom was the one with two loop points. The next was one with three loop points. Then we skipped right ahead and made one that had six loop points. Even little Del was intent on having a go. She's got a lot of focus for a kid that's just turned three last week, but I guess when you can see your two older sisters doing something, you really want to do it too. 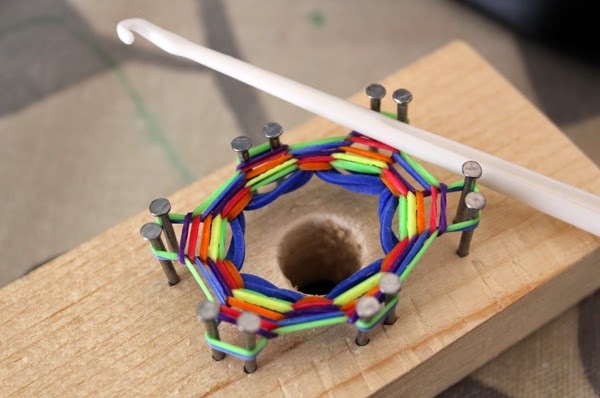 I put together a bunch of photos to show how the three loop point bracelet starts, builds, and ties off. If you click on the image below it should open up the full size image for you to see it better. The black bands that you see making the start are eventually snipped with scissors and pulled out and thrown away. Hope that was of some use to someone out there. My kids are having so much fun with this stuff. It's lovely that they want to make them for friends and it's great that they are small and light, so cheap to send to friends overseas too! 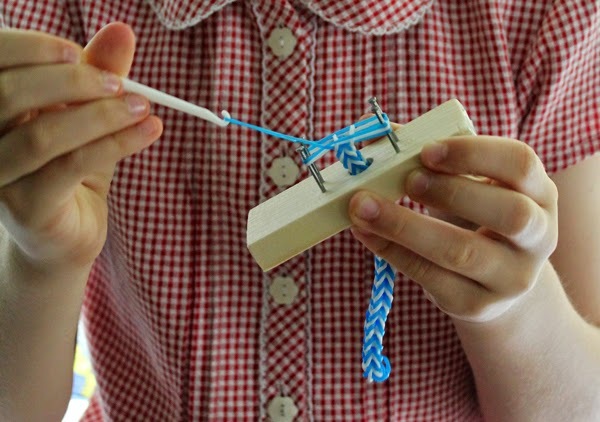 It's very much like those dolly bobbin french knitting thingies we used to have as kids, but just so much easier and more fun with elastic bands. My kids are obsessed too. I have been having fighting issues with who gets the loom when. I think I will get my hands on some wood and make some extras so we can all have one. As clever as usual ! Lindsey, thank you so much! 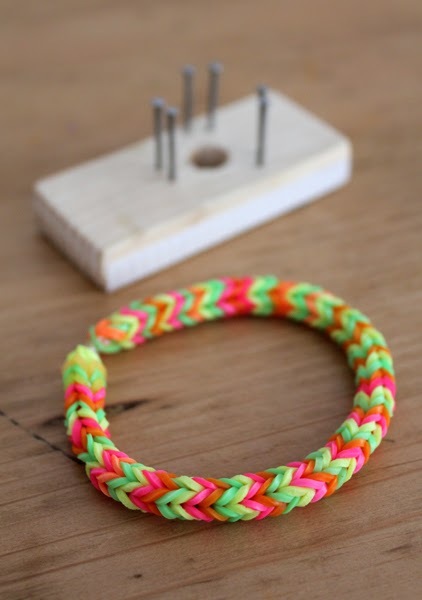 Now I can provide these children to a homemade loom and let them make bracelets, rings and keyhangers too!